Let’s not mince words here – until Abel Trujillo and Jamie Varner threw down for seven minutes and 32 seconds in the UFC 169 main card opener in February, that card was pretty bad. But these lightweights ignited the crowd at Prudential Center with an all-out slugfest in which both men took turns rocking each other until a single right hand by Trujillo put Varner down and out in the second round. This was great stuff capped off with a great finish. There was more than a little heat between featherweights Mike Wilkinson and Niklas Backstrom before their October meeting in Sweden, and British veteran Wilkinson may have taken a little offense to all the attention being paid to the rising Swedish star. But that’s the beauty of this game, the idea that when the Octagon door closes, you can air all your grievances with your fists. And that’s what Wilkinson did, with a crushing right hand putting Backstrom down and out 79 seconds into the fight. 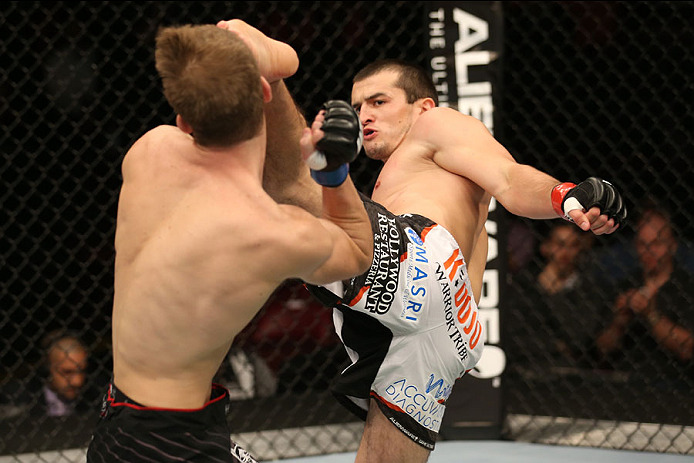 Albert Tumenov’s UFC career got off to a rough start when he lost a split decision to Ildemar Alcantara in February, but the Russian welterweight prospect showed glimpses of his powerful striking game when he knocked out Anthony Lapsley in May. There was more than a glimpse of what “Einstein” could do with his hands and feet in October though, as the second of two vicious head kicks finished off Matt Dwyer in just 63 seconds. It was the end no one saw coming, especially not Mark Hunt. But after “The Super Samoan” got off to a fast start against Fabricio Werdum in their UFC 180 bout for the interim UFC heavyweight title, Werdum turned things around suddenly in the second round with a flying knee that put the steel-chinned Hunt on the deck. The follow-up series of ground strikes brought an official halt to the bout, but it was the knee that added Werdum’s name to the list of UFC champions. It wasn’t a repeat of their first meeting over two years ago in terms of a sustained 25 minutes of action, but on March 23 at the sweltering Ginasio Nelio Dias in Natal, Brazil, veteran MMA superstars Dan Henderson and Mauricio “Shogun” Rua added another worthy chapter to their series, with “Hendo” emerging victorious once again, snapping a three-fight losing streak this time by way of a come from behind third-round knockout that proved his “H-Bomb” of a right hand was still as destructive as ever. As a longtime fan of Minotauro Nogueira, this one wasn’t easy to watch, but it was one of the most devastating knockouts you will see. 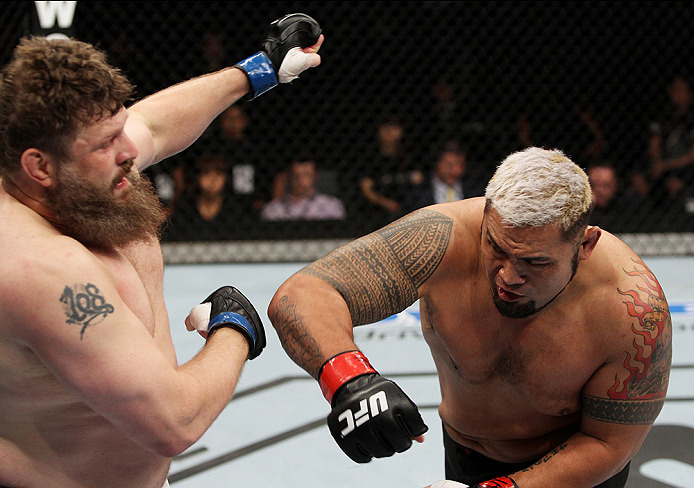 Everyone knows how potent the right hand of Roy “Big Country” Nelson is, and in Abu Dhabi in April, he threw it until it caught the Brazilian icon, and when it nailed him flush, Nelson didn’t even go in for the follow-up as he knew that the fight was over. Fighting after a long layoff and on the birthday of his late girlfriend, Josh Samman had plenty of emotions running through him when he faced highly-regarded TUF 19 winner Eddie Gordon in December. So if you’re talking about a feel good story seeing Samman win, it’s there, and adding in this Knockout of the Year candidate, which came courtesy of a flush right kick to the head, only adds to one of the most memorable comebacks of 2014. Plenty of fighters try flying knees. Some have good technique when throwing them, others even land them. But I can’t recall a more perfect execution and result of a flying knee than what we saw at UFC 172 in April, as TUF 18’s Chris Beal fired one off that landed flush on Patrick Williams and knocked him out as soon as it hit. Referee Herb Dean didn’t need to do anything at that point except stop the fight, and that’s what he did, with Beal kicking off his UFC career in style. 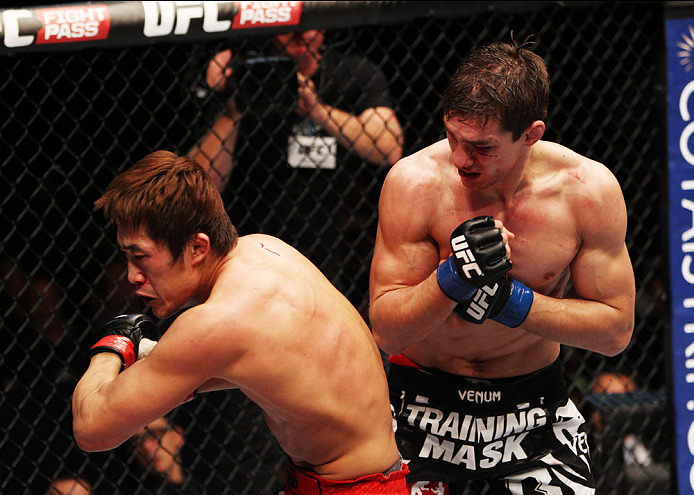 South Korea’s Dong Hyun Kim has gone through a transformation in his last few fights in the UFC, replacing his conservative grappling-based attack with an aggressive, crowd-pleasing assault. In March, Kim took on England’s John Hathaway, and in the third round he scored with a spinning elbow that knocked “The Hitman” out immediately. What places it at number one on this list isn’t just the technique involved and the finality of the shot, but the sound. Even through computer speakers, when you heard him land the elbow, you knew the fight was over. That’s a scary knockout, and in my eyes it’s clearly the best of 2014.